"How to make sister blades in Kobuse steel construction"
We have received a question from a customer about making sister blades in the Kobuse steel construction. But sometimes, he prepares one steel bar that is already constructed by the Kobuse construction, and then cuts it into two pieces to make two blades. That may be a way to make tanto blades of sisters. It is constructed with core steel and outer steel by Kobuse style. The outer steel is fold-welded 16 times. 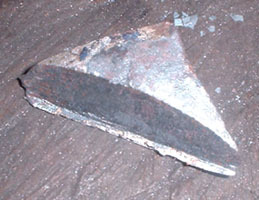 The steel bar is cut into two pieces to make two blades. The smith is preparing two blades as candidates for the order. They are sisters. As I understand kobuse style from your drawing, one blade will be correct and the other blade will have the inner core exposed on the cutting edge. We think the question is very natural from the less explanation in the article. We will try to solve the confusion using the smith's hand drawing. The sisters are prepared, those are the same in both core steel and outer steel. Incidentally, this is a cut off piece come from the back tip. 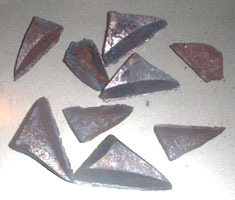 The smith collects them and makes a steel for blade again, or sometimes tsuba. The sisters are shaped with hammer. They are Osoraku-zukuri style. They are shaped with plane and file. Just after the work, they are on the temporary polish to see the result. Some curvature has occurred. 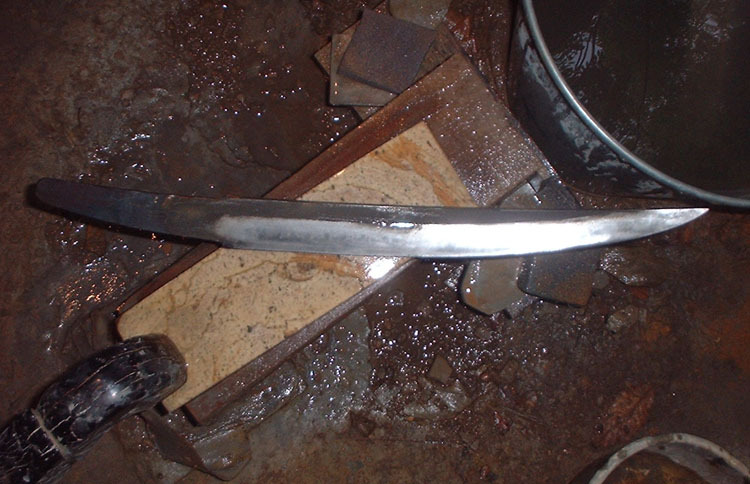 The smith would make the same hardening work on the both, but the result are not the same. They are shaped with the Arato stone. The steel particles and hamon particles on the A are denser than those on the B. In other words, the A seems hard, and the B seems mild. The difference of the blade character would come from the unconscious difference of the hardening work.